In Horse Valley it is a perfect day to go kite flying. Jack, Max, Lax, and Donkey decide to get creative by putting together their own homemade kites. However, Donkey's kite doesn't turn out very good. No matter how hard he tries to get it to fly, it just keeps tumbling to the ground. 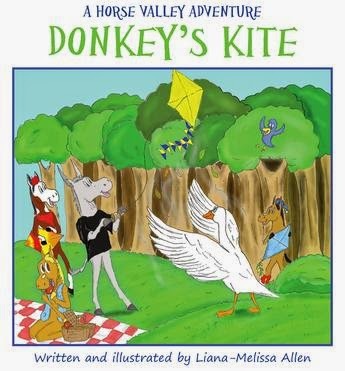 How will poor Donkey get his kite to fly? Well, a friendly goose named Gusty is delighted to help him out. In this Horse Valley Adventure, Donkey learns not to give up when all seems hopeless. They all learn a lesson about helping others and true friendship. What can I say? Liana-Melissa Allen has another wonderful book on her hands. The illustrations are still fantastic, the writing still fun and at a level that children can understand and there are even more lessons to be learned and talked about. The illustrations alone are going to hold a child's attention with their colorful storytelling. At this rate, little Harrison is going to have one fantastic library and he isn't even here yet!